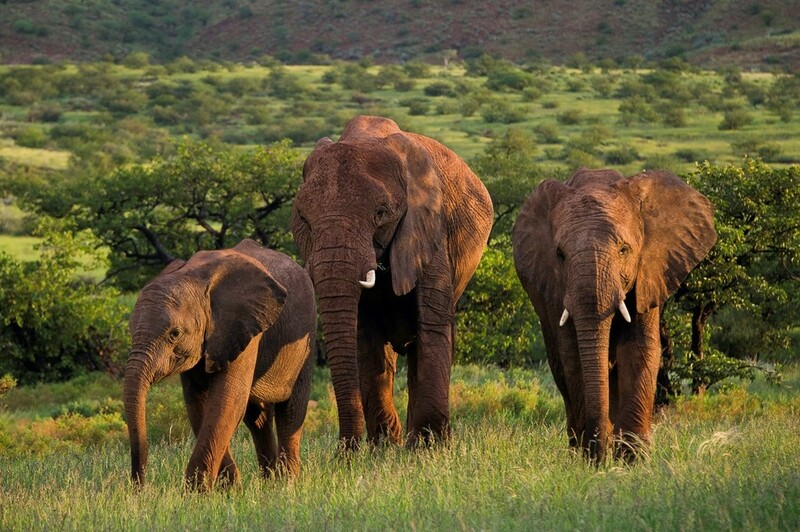 Namibia points of interest - 12 must see wildlife areas and photogenic locations, including Namib Rand, Kaokoland, Swakopmund, Skeleton coast & Damaraland. This scenic wonder, an extraordinarily beautiful expanse of sand dunes (some among the highest in the world), mountains, river valleys and plains, is the desert in a microcosm. 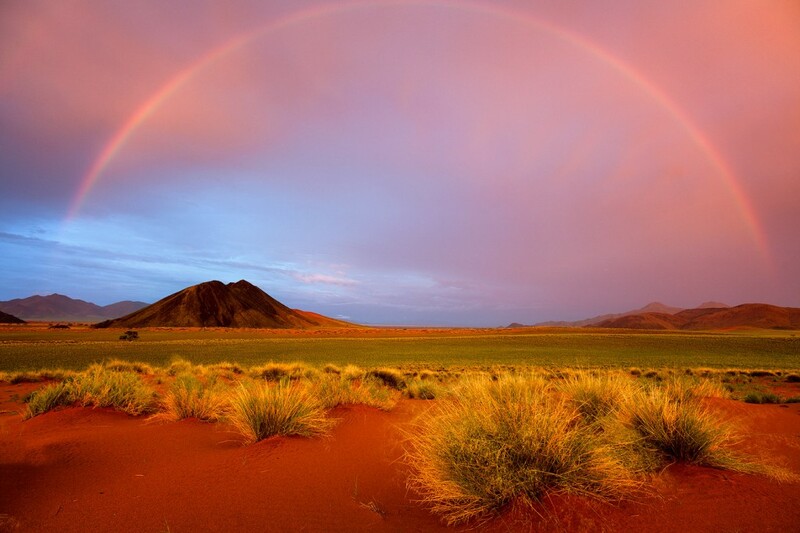 Namib Rand is home to some remarkably tenacious plants and animals and also offers a fascinating insight into a really challenging habitat. 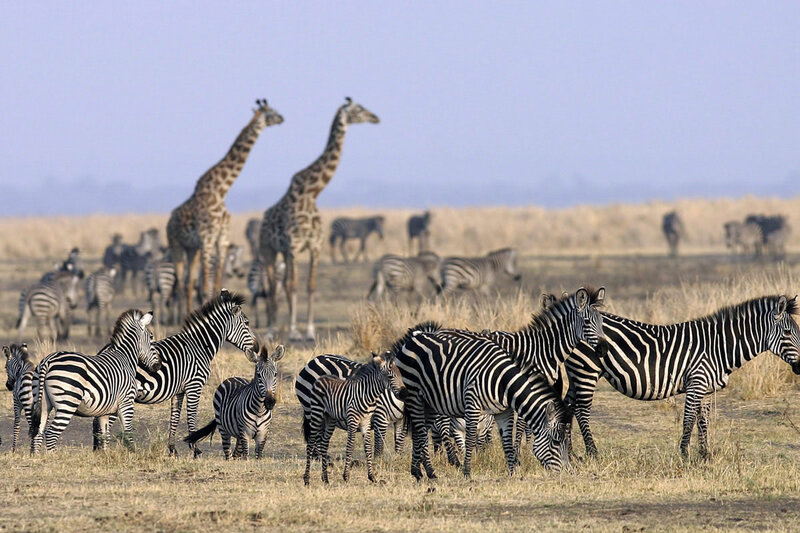 Oryx, ostrich, zebra and giraffe, as well as a number of beetles and lizards have managed to adapt to survive here. 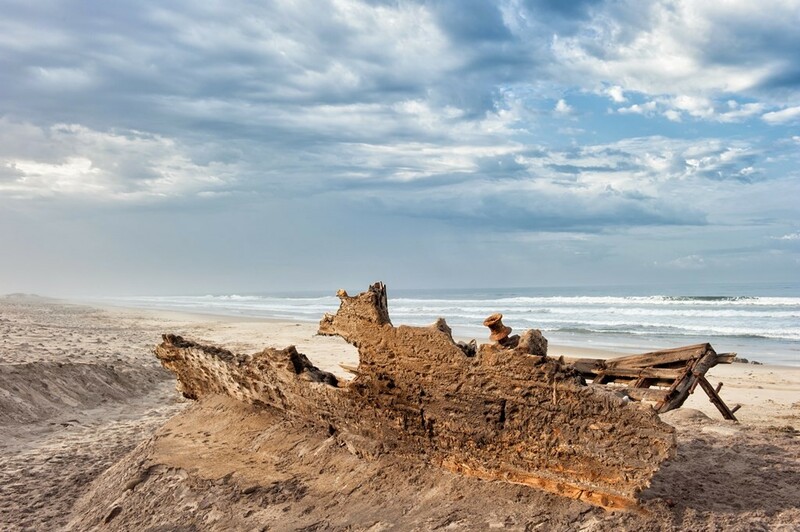 It might sound odd, but this quirky little coastal town is a highlight of Namibia. 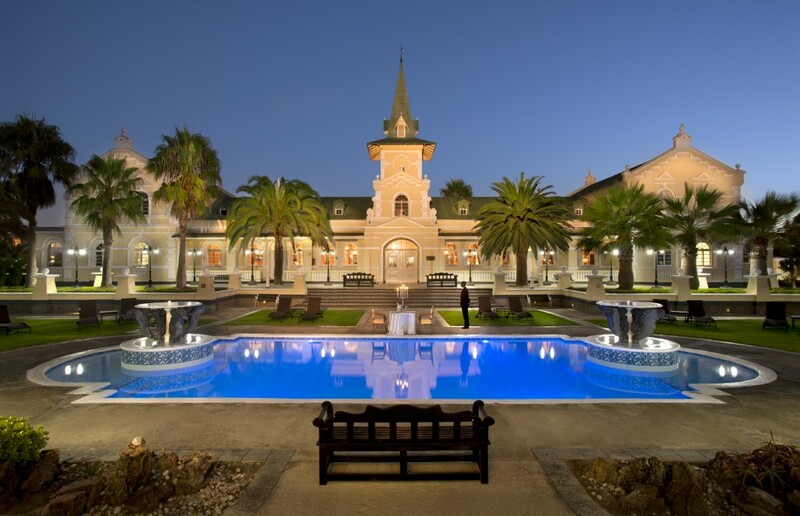 Germanic in atmosphere, Swakopmund is a welcome refuge from the heat and dry of the desert and the cold of the coast. 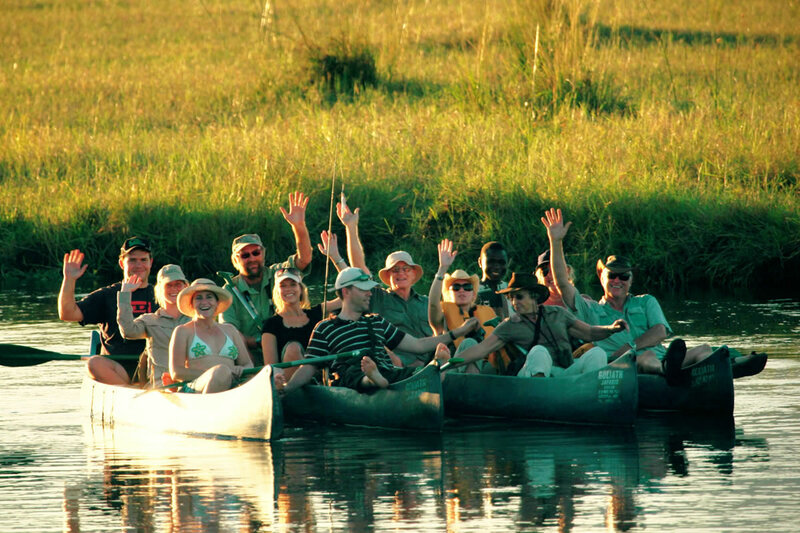 It’s great for a night or two with plenty of adventure activities nearby, as well as excellent restaurants and fun accommodation. 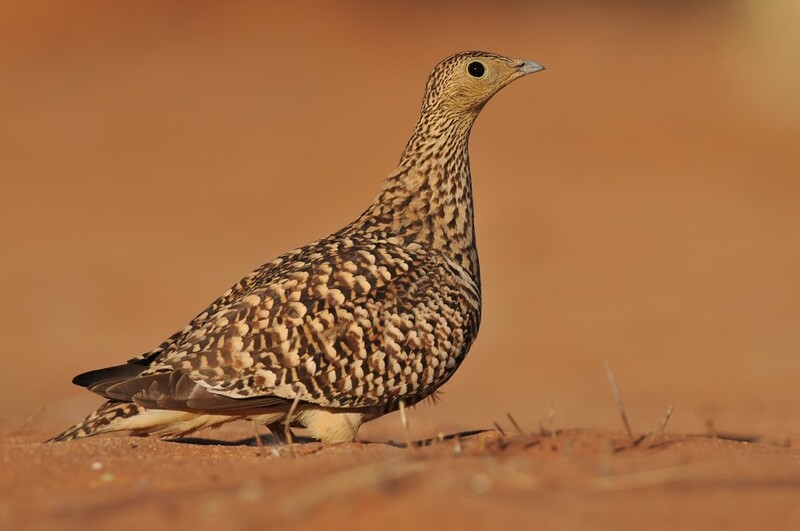 Among my very favourite things in Africa is the warbling, fluting chattering sound of sand grouse ‘talking’ to each other. They are delightful birds, sociable, hard-working, very good parents, attractively marked and very good at living on what appears to be nothing. 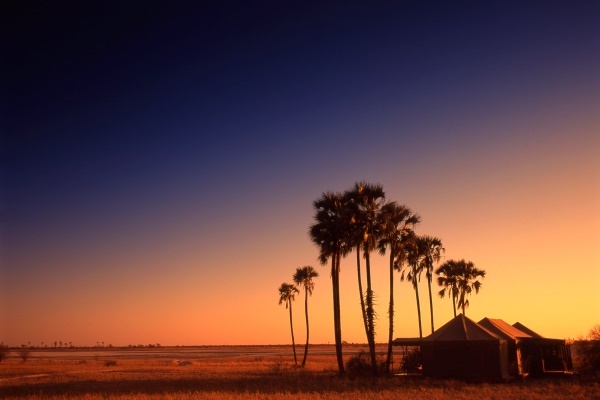 This land of red rock mountains, carved river valleys, white barked trees, elephants, rhinos and people who speak in a click language is a beautiful place. 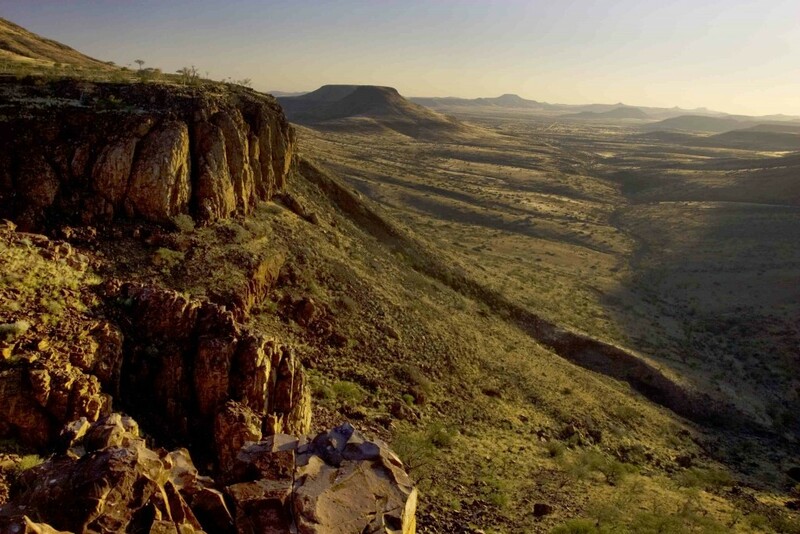 Damaraland has a great cultural heritage too, with large numbers of ancient rock paintings and some magnificent mountain-side engravings – a veritable gallery of ‘bushman’ observations and ideas saved for posterity. 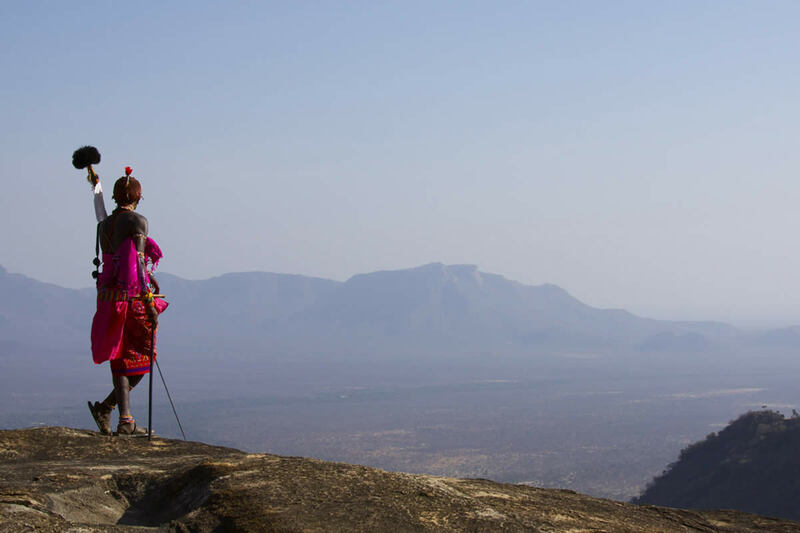 This charismatic camp sits surrounded by spectacular flat topped mountains in a wonderful 125,000 acres of wilderness. There are several rivers that flow now and again, but permanent springs offer sustenance for the surprisingly prolific wildlife. Mountain zebra, giraffe, oryx, springbok, kudu, impala, jackal, rhino, elephant, lion, leopard and hyena all live here, and thanks to the superb guiding and the ability to walk anywhere, it’s likely that you will see evidence of plenty of species. One of the most engaging things I saw during my recent visit was flocks of flamingos from the air. With their long necks and legs stretching well beyond their bodies, their mostly white outline edged with a deep pink, they were very striking indeed. For such lanky birds they are surprisingly agile once airborne and watching them wheel and swoop was great fun. 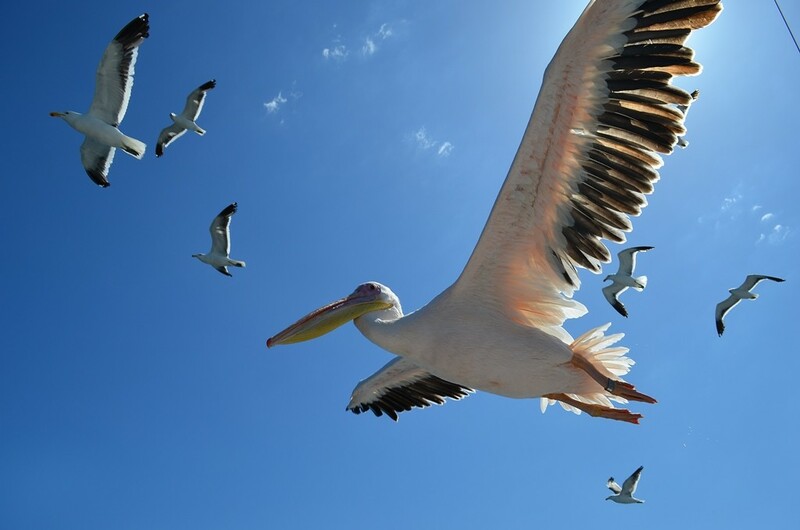 Pelicans remind me of flying boats, with their bulky bodies and huge bills, and the way they take to the air fits with this analogy, needing a long runway to gain enough speed for lift off. Seals line the coast, living in dense communities wherever the kelp beds are great enough. There’s nowhere else in Africa that I know of where you can see all three species living cheek by jowl, making this a very special region. 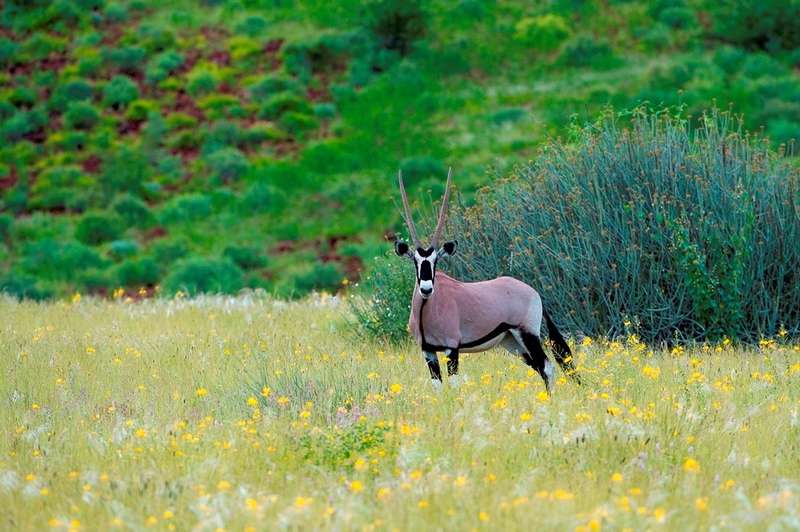 Wherever it seems like no large mammals can possibly thrive, you’ll find an oryx. They seem to be everywhere in Namibia, appearing from nowhere amidst a world of sand and barren rock. Springbok, zebra, and ostrich also appear immune, or at least inured, to hardship, and can be found in similarly unlikely places. Weird, wonderful and adaptable, I love Namibia’s desert plants. 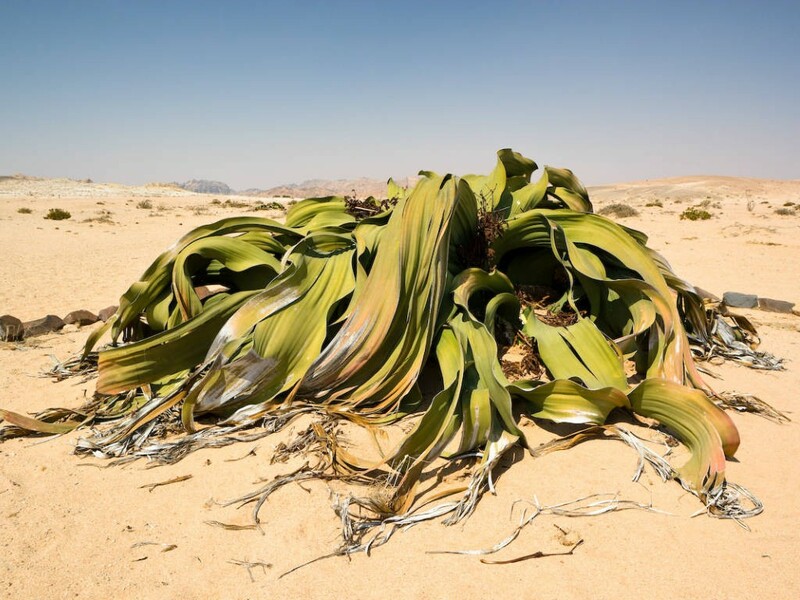 One of my favourites is the Welwitschia, an ancient form of pine tree which has adapted, over millions of years, to an increasingly arid existence. One might expect that lifespans would be short, but not in this case, with some examples of the plant judged to be more than 1,000 years old. There are toxic euphorbia too, which black rhinoceros, another surprising resident of the region, are able to eat. It seems that doing so has a narcotic effect, perhaps adversely influencing their notorious irascibility, but it’s just another remarkable animal adaptation here. I love stories about restoring a land, returning it to how it was before man settled and turned it to agriculture. 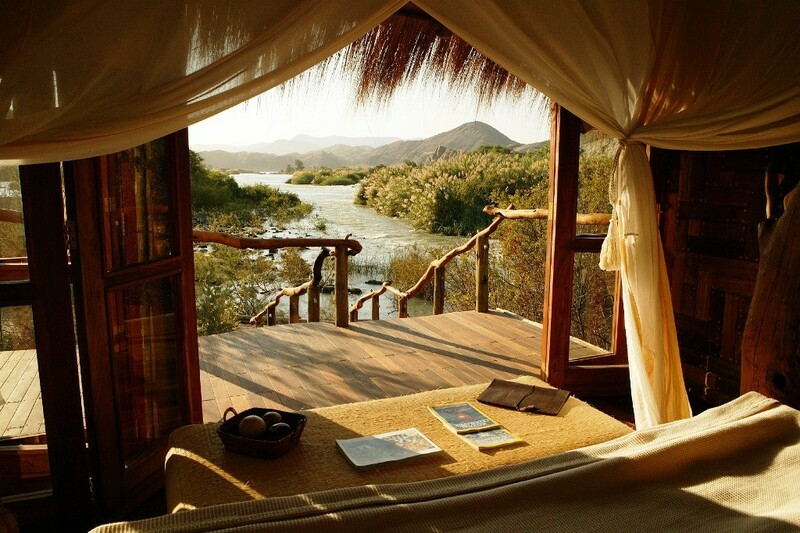 Okonjima is such a place, which now exists solely to facilitate conservation and educating about the wild. It’s a collection of former cattle farms, allowed to return to their natural state, and which carry a significant population of leopard and cheetah. 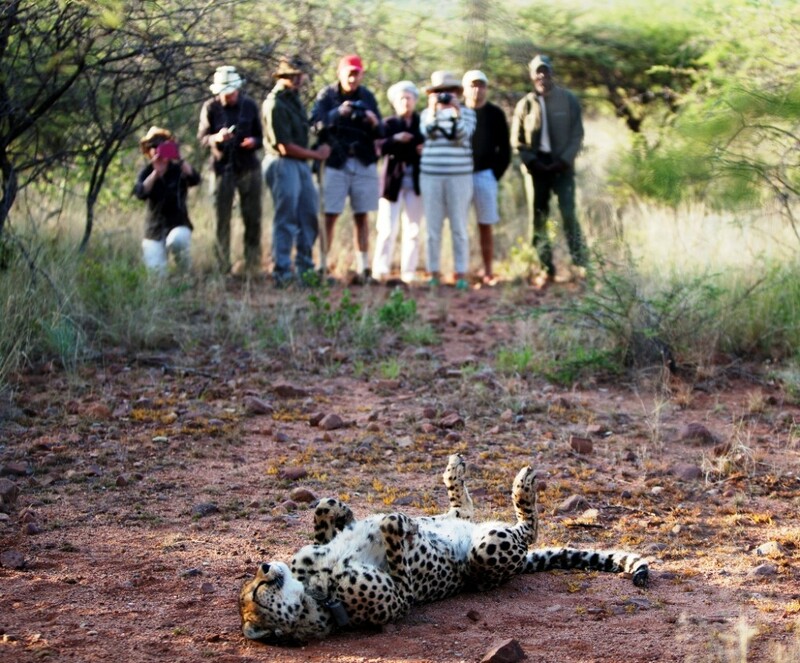 There is a variety of accommodation options here, from a simple camp site to an immensely luxurious family villa, and all guests can learn about the conservation aspect as well as enjoying walks and cheetah tracking. 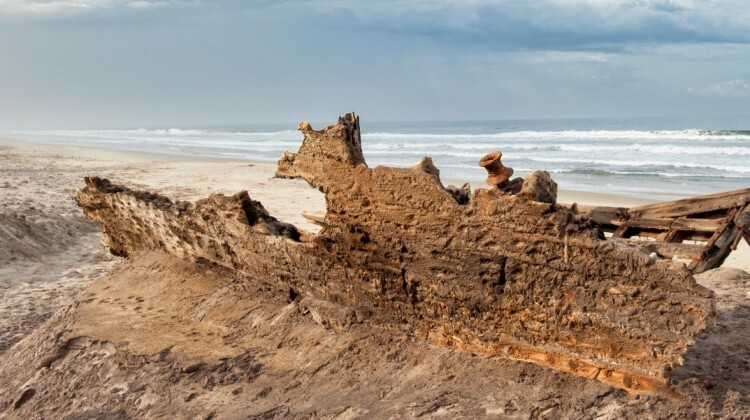 Cold, arid, remote and hazardous, the Skeleton Coast appears to have been aptly named at first glance, being littered with the remains of numerous large ships that have run aground over several centuries. 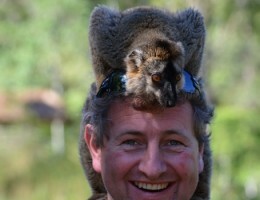 But, take a flight along its length and a bigger picture emerges of a rich and rewarding place to visit. Away from the wreckage strewn shore is a plethora of plant and animal species, adapted to life in a dry environment that rarely if ever receives rain, including some which get all the water they need from the coastal fog that rolls in daily. This spectacular river flows for more than 1,000 kilometres from Angola’s highlands to the coast, forming the Angola/Namibia border for more than 400 kilometres. The region thorough which it flows is spectacular, with big mountains and great broad sand covered plains. The green zone either side of the river (rarely more than 20 – 30 metres wide each side) supports a wide range of life while the generous volume of water against the rugged mountains and the ochre sand, makes the Kunene River a beautiful and dramatic feature of a magnificent and remote landscape. 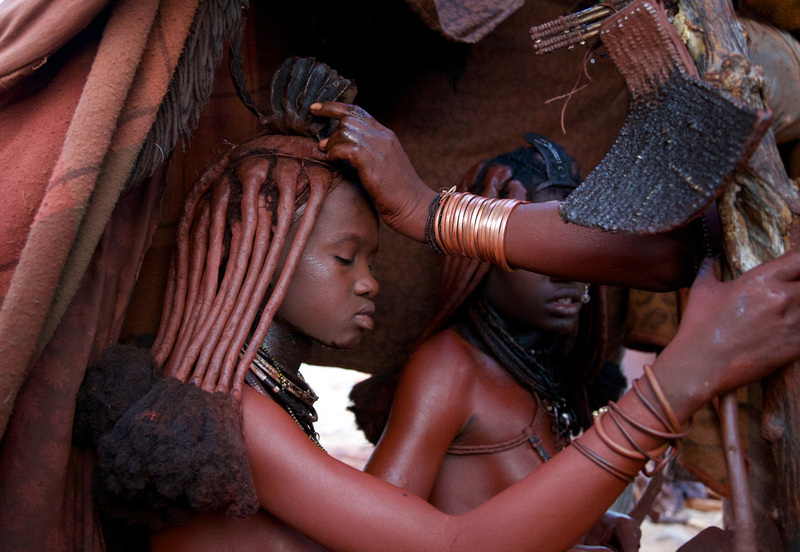 The handsome Himba people have chosen to live in Kaokoland, one of the planet’s toughest regions. Why is something of a mystery, but they have been here for more than 400 years eking out a life where most would deem it impossible. These desert nomads move with the weather, relocating their simple settlements when they need to lead their precious cattle to fresh grazing. Their social structure and tribal culture have also helped them to adapt to life here, giving them a degree of adaptability and flexibility rarely seen among tribal people.